Scholarships are hands-down the best way to finance an education, but getting them isn’t always easy, and even finding enough scholarships to apply for can be a challenge. Fortunately, there are many sites online devoted to helping students find scholarships of all types, from merit-based academic scholarships to those that offer students with specific interests or experience a shot at more college funding, and even contests where students can compete in academic challenges to win tuition money. These databases, search tools, and lists are the best of the best for students who are serious about getting as many great scholarships as possible. This list isn’t meant as a ranking, but rather a resource, a database in itself, of the best scholarship lists, databases, and resources out there. Many of the resources listed here are databases and search engines for finding scholarships of all types, but there are also lists of scholarships offered by specific organizations, and some general tools and sources of information that are important for scholarship-seekers to consider. And here’s our YesCollege scholarship database. The depth of the searching tools on Scholarships.com is very notable and the site makes use of the resources at its disposal. The site assists with helping colleges recruit and has an extensive list of scholarship categories as well. In terms of understanding how to pay for school, FastWeb is one of the most efficient at working with students to educate them on all the financial aspects of college, specifically their great content on scholarships. CollegeXpress lets students search for a wide number of scholarships in order to fund college. Additionally, they provide their own scholarship and even guidance for school. SallieMae’s College Answer works with students to show them all the scholarship opportunities available. College Answer’s database includes over 3 million scholarships, so it’s likely you will be able to find something tailored to your needs. MeritAid.com pairs students with a plethora of merit-based scholarships that help them to have the resources they need to succeed and graduate with the smallest financial burden placed on their shoulders. Simple Tuition is great because not only do they provide a great scholarship search engine, but they also equip students with some of the best advice for successfully attaining the scholarships. College Prowler lets students browse through scholarships and breaks them down by career, major, interest, military, race, religion, and many other categories. For those looking for the best options to bridge a gap in finances, this site is incredibly helpful. Big Future from The College Board helps students find scholarships, financial aid, and internships. They analyze over 2,200 programs, so students will always have access to one of the largest libraries of material in the country when it comes to locating these scholarships. Findtuition.com is a great search engine to look through over 1.7 million scholarships with a worth of over 7 billion dollars. For students wanting to comb through one of the largest scholarship databases available, look no further. Almost all colleges find and recruit students through standardized test scores. Zinch allows students to be seen for what they are — not just numbers, but people. With more than 800 schools and $1 billion in scholarships, Zinch has quickly become the standard for helping students succeed. Zinch is now 3 million plus students and growing fast. AidScholar allows students to quickly and efficiently examine different scholarships and their respective deadlines with ease. It boasts some of the most extensive search features when it comes to locating scholarships and is great for students. Going to college is viewed in many different lights, some apprehensive to what will happen to them, others excited for the wide-ranging activities and freedom associated with it. Adventures In Education emphasizes college for what it sound be – an adventure that allows you to grow. Their search tools for locating a scholarship are fantastic for anyone looking to fund their education more efficiently. The College Solution looks at the most important aspects of how to get to where you’d like to be in college and that includes scholarships as well. The tool for Merit Scholarship Searches is incredibly engaging as well. StudentScholarships.org is a dense resource that accommodates the needs of many different students by providing many different ways for them to locate scholarships. Student Scholarship Search lists some of the scholarships that are attainable to many different people. The site has an innovative “Scholarship Matcher” as well that helps find scholarships that are best suited to you. FindTheBest works to be completely unbiased when helping students locate the most pertinent college scholarships. Their incredibly specific tools for refining searches are also very notable. My College Options has an intuitive scholarship search tool that allows students to sift through over 60,000 scholarships. Additionally, they break down scholarships by parameters such as location, major, ethnicity, and religion. Do Something.org is a non-profit organization focused on young people and social change, often focusing on some of the most prominent problems in society today. Their scholarships help those who are passionate about the causes they support. ScholarshipPositions helps students around the world search and attain scholarships and financial aid that allows them to chase their dreams and finance their college education. CollegeWhale focuses on providing students with scholarships in whatever way possible. The site’s intensive search tool allows for impressive specificity when locating scholarships of any type. CollegeNET allows for searching through a large database of scholarships through integral keywords and even allows for saving progress so that students may come back to it. It’s definitely a resource that should not be missed when looking for school financing. Nerd Wallet is an interactive scholarship guide that allows students to change many different searching parameters to cater results to their specific college path quickly and efficiently to best attain the highest quality and most lucrative scholarships currently available. Scholarship America highlights all scholarships currently open and how students can pay for as much school through scholarships as possible. When it comes to accessing appropriate scholarships for your specific degree, Scholarship America is a very formidable source. Scholarship Experts breaks down the complex process of locating scholarships into a much easier task to manage and the insight makes understand what students need to do crystal clear. Since they regularly publish so much information pertaining to scholarships, it’s the best way to prepare for college. More Great Info: Who Should Apply? Scholarship Academy works to enrich the lives of students by contributing to scholarship preparation and focus. It’s great for students who don’t have as much guidance and/or are looking for help. Scholarship Junkies leads a number of scholarship workshops designed to educate and empower students to find scholarships and best succeed in the collegiate endeavors. The site’s commitment to working with students has catapulted them to being renowned concerning scholarships. School Soup is a search tool designed to help college students chase their dreams and not worry about the inhibitions that the exceedingly high costs impose on them. The site breaks down great information on financial aid, degrees, careers, colleges, and even scholarships. Campus Explorer provides great articles on scholarships, innovative categories for breaking down the different types, and even a way to sort scholarships by school. When it comes to the most useful sources on the market, this should not be missed. College Data filters scholarships by a variety of parameters, all which contribute to a student’s ease of accessibility when it comes to finding the most appropriate scholarship for them. For those members of minority groups who are looking to take advantage of every scholarship opportunity available, MinorityNurse.com helps with a great list of scholarships available exclusively to those who are minorities and majoring in nursing. DiscusAwards has created a list of college scholarships for students to pick through and find as many that are applicable to their particular situation as possible. The guide is incredibly straightforward and easy to scroll through. Amish Scholarships work with the Amish community and those with Amish descent to provide financial assistance and have the resources to succeed as they further assimilate into society and face adverse circumstances. Graduate Tutor is an engaging scholarship finder that enables students to find whatever they need to succeed in college when it comes to ensuring all financial needs are met. The site is great because of the incredible depth in finding scholarships of any type. Scholarship Points is a membership program that lets students earn points for completing different activities. The points function as chances to win different scholarships and then are awarded on a monthly basis. It’s a fun and fresh perspective on attaining scholarships. The Princeton Review has long stood as one of the most reputable sources for college advice, news, and much more. Their Scholarships and Financial Aid Section has been significantly refined to provide the most essential content to college students. Teach Thought helps students by breaking down 4 of the most popular sites for finding and attaining scholarships in a variety of circumstances. It’s a great place to get started when beginning to figure out how to pay for college. International Scholarships fills the gap that exists many times for those who wish to study abroad or attend universities in other countries. It’s a great way to find funding for school while expanding your horizons. For Inspiration and Recognition of Science and Technology has an incredible scholarship program that works to acknowledge some of the awesome work these students have contributed to their communities. The College Expo has some incredibly valuable tools for preparing for college and best positioning oneself for financial success. Their scholarship listing is great for sifting through the large amounts of scholarships that are readily available to students. The Benjamin A. Gilman International Scholarship helps students who are receiving Pell Grants to have the funds to study or intern abroad. The goal is to provide those who come from backgrounds with less money to have the same opportunities afforded to them as those with larger, more disposable incomes. Scholarship Mentor works to equip students with everything they need in terms of scholarships to adequately provide for themselves and be best situated through college. Their blog is particularly useful and provide introspective posts that are dense with information. HOPE Scholarship Initiative is a non-profit that helps empower low-income students or those with financial hardships to ensure they have the funds to complete college and be successful. Additionally, they have a useful blog. 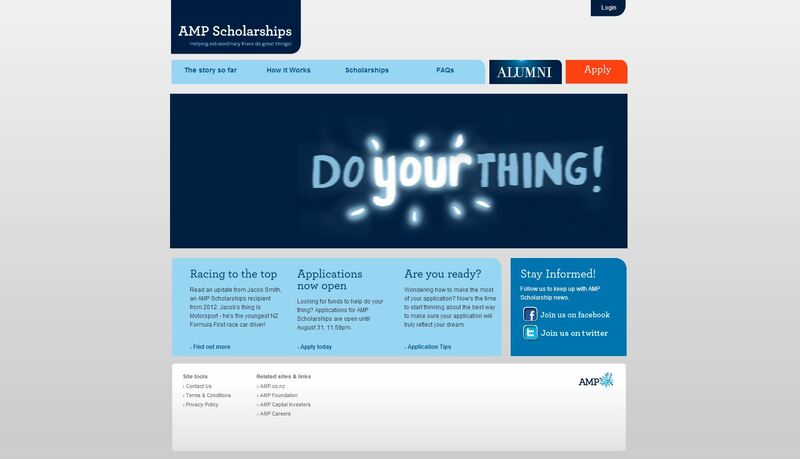 AMP Scholarships are awarded only in New Zealand, to people who need help making a dream come true. While some AMP scholarships fund educational goals, they aren’t limited to paying for college, and many have been used to fulfill other great needs. Scholarships Canada is an engaging site that helps Canadian students to live up to their dreams and have the most accessible ways to pay for college. The 21st century is all about researching alternative financing methods to pay for school, so find yours now. College Confidential is the world’s largest college forum and has many different resources for finding scholarships, grants, and other tuition support. It’s great for locating some of the more obscure scholarships that many times make all the difference. The Gates Millennium Scholars is a grant from the Bill & Melinda Gates Foundation that focuses on helping 1,000 students through college and providing them academic support to ensure they stay on a path of success. Hispanic Scholarship Fund is an organization that helps students of Hispanic descent to fill in the gap they may need for financial aid. It helps ensure that some of the brightest students in America are still entitled to a chance to succeed. The Association on American Indian Affairs is a go-to source for descendants of American Indians. The scholarships they provide enable students the ability to attend college that may have previously not had the options available to them. It’s imperative that all students of American Indian descent look at this valuable resource. NextStepU provides all the guidance and support one would need when applying and planning for college, scholarships, and more. In terms of locating scholarships, it’s very formidable. UNCF’s Scholarship Search is a minimalistic approach that doesn’t overload you with information you don’t need. It provides you a search form for scholarships and immediately gets you going on locating the best ones for you. Fast Aid is a searching tool that works with students to find scholarships, fellowships, grants, and more. It’s a great tool and is run by the renowned author Dan Cassidy who authored “The Scholarship Book”. College Financial Advisors provide students all the need-to-know information on financing a college education and how to do so with the smallest overhead possible. Central Scholarship is an innovative source for funding college. They help provide scholarships worth $10,000 that can be earned 4 times. Scholarships 360 is an informative guide to the most important scholarships and financial aid to college students today. They also have great information on courses and a great blog. Study and Scholarships focuses on providing those from Africa and developing countries scholarships to allow them to flourish in college and succeed in going to school in the United States. PK Students is a great site for looking through different news and lists on scholarships. For Pakistani students, it is definitely a go-to source for locating some of the best opportunities available in the world. Career OneStop is a foundational tool that helps people advance their careers in a number of ways. They have an innovative section on assisting students in college with the options available to get scholarships and be in the best position possible upon graduation. Captain U Scholarships helps student-athletes find a scholarship designed to reward them for their hard work and contributions to their school and the athletic program they are a part of. It’s easy to apply and provides a great foundation for scholarship funds. The Scholarship Center has a chief goal of making college affordable to everyone. Through their useful scholarship search tool, students can locate scholarships seemingly tailored to them. The site also has a great blog from which to gain fantastic advice and guidance. More Great Info: Community Service: Just How Important Is It When It Comes To Obtaining Scholarships? Scholarship Times has information on scholarships around the world for all types of universities and even postgraduate scholarships. Their newsletter makes a fantastic supplementary tool for getting some of the newest information on scholarships. Grant Scholarship shows how students can aptly prepare themselves for college by providing a number of scholarships they can apply for. It’s great for those who are starting to fill out the scholarship process. Get Schooled is a colorful, engaging site that pairs students with the tools to get to college and stay committed enough to graduate. The posts cover various areas concerning college, but help reinforce the idea of how important it is to finish. Scholarship Keys details how students can get all the scholarships they need to afford college and graduate into success. The site has detailed scholarship tools, including a Full Ride scholarship Program. Indigenous Scholarships advocates for individuals from the indigenous parts of Australia and helps provide them with over 300 different scholarships for school. They even allow students to search through different universities to see what offerings are available. SAGE Scholars has some of the most comprehensive resources for locating scholarships and understanding the benefits that the proper research can have on the college process. Financial Aid Finder breaks down many different scholarships for students that they will for very useful. All the different sections emphasize the need for students to look into as many options as possible when paying for college. Saving for College outlines the best ways students can appropriately prepare themselves for the large burdens that college can place on one. The site breaks down useful scholarship books and sites to soften the blow college can impose. MillionDollarScholar chronicles a success story of how one student was awarded over a million dollars in scholarships and how his refusal to let adverse conditions affect his ability to go to college. The site functions as a tool for educating, coaching, and underlining how a student’s future is in their own hands. The Scholarship Page is a free tool that assists students with finding the scholarships that most closely fit their unique circumstances. They’re equipped to show students how to get scholarships for associates, bachelors, masters, and even PhD’s. This Way To CPA shows anyone how they can work their way towards a CPA and it starts with getting a college degree. The site provides such an expansive list of scholarships that these students will qualify for, almost ensuring something will work out. Beat-Tuition.com gives great advice for attaining the scholarships desired, and often needed, to attend college. The site’s vast amount of knowledge helps prepare students for everything college has to offer. Choose Your Future’s College Scholarship Guide is a downloadable tool for looking at all of the options students have for scholarships around the country. It goes step-by-step through how to get the scholarship of your dreams. Go College has all the resources one would need to properly prepare themselves for school, including search tips, a scholarship funnel, and award types. It’s great for finding whatever you need concerning scholarships. Hellenic Communication Services has an incredible index of scholarships and grants available to students. It’s a very useful place to browse the different types of scholarships and their benefits. Iget Scholarship gives students the best resources online to enable the most opportunities concerning financing school. The site also has great news links concerning education that should not be missed. Innovation comes in a number of forms and Immediate Scholarships is a great way to utilize free scholarship applications and receive anywhere from $500-$50,000. They provide a wealth of scholarship information useful to any prospective student. College Cures serves great advice on how to get into college, stay healthy while there, and even the best ways to go about applying for scholarships. For prospective students, it’s a great way to get info on how to navigate the obstacles of college. MigrantStudents.org helps 2,000 students from migrant and season farm working backgrounds to help them have the needs to succeed in college. The site recognizes the incredible obstacles many of these students have face to get through high school and works to provide them as much support through college as they can. MoolahSPOT looks at the ways for students to search for scholarships and minimize the cost of college. It has an incredibly straightforward design that is both efficient and useful. Scholarship Hunter helps prepare students to not face such large debt upon graduating college by allowing them to search through a wide number of scholarships. They break essays down into 5 easy to understand categories and have financial aid advice as well. ScholarshipDb.net is a search tool designed to assist college students with overcoming any obstacles that may stand in the way of them going to school. The site has great information on university jobs, research, and extensive Post-graduate resources. Scholarships & Grants showcases some of the most useful information for how to get scholarships and prepare yourself for a successful college experience. It’s a great source for women who are the first in their family to attend college as well. ScholarshipZone allows students to build a profile and then submit their information to a wide variety of scholarships around the country. They also provide degree and program information to help get started with school. ScholarSTUFF.com lists all the different resources and tools students will have access to in order to best locate scholarships and loans for secondary education. Additionally, the site has tools for online schools, study abroad resources, and even research paper help. 10,000 Degrees implements many different programs that focus on providing students seeking to go to college the ability to do so. By helping students leverage additional financial aid, they provide care from start to finish on how to properly make it through school. StudyAbroad.com tells students all they need to know to get scholarships for studying abroad. This is an integral part to going abroad because many times, the cost of a semester abroad is significantly higher than attending college. The site equips students with information that makes offsetting the cost of going abroad much lighter and easier to understand. SuperCollege.com has an incredibly diverse array of scholarships to search through and locate the best for your particular circumstances. Additionally, they have very useful 10 Step Guides for getting more information on anything pertaining to college. The Guide to Scholarships presents a refreshing angle on locating the best scholarships for college students and securing them. The site has a great blog also that highlights scholarships from around the country and why they’re so sought after. The Scholarship and Recognition Programs page from ETS.org makes a great resource for exploring the different ways students can take advantage of their most notable skills and further capitalize on the advantages scholarships provide financially. U.S. Scholarship Guide looks at many different resources and compiles all the best ways to find scholarships throughout the country. From minority scholarships to grants, loans, and more, students should take note of its ease of use. Discover Nursing is an engaging site that allows nurses to readily access a plethora of high quality nursing scholarships. It breaks down all requirements for each scholarship, be it gender, GPA, ethnicity, or others. The philosophy behind awarding scholarships is rooted in the notion that different organizations pick a student that they ardently believe in, to the extent that they wish to financially support them to an extent. Junior Achievement’s Scholarships for College page underlines these n options and provides a great list of available scholarships for students. Quest Bridge highlights all of the most important scholarship search engines and combines them into one list. It’s great for students to get started. There are many different ways to approach the scholarship process and College Scholarships.org makes it easier for everyone to find and apply for all the relevant scholarships. The site even provides essay tips. Think HBCU offers comprehensive lists of scholarships and scholarship finding resources that are specifically geared towards prospective students at Historically Black Colleges and Universities. Education Corner is a great source for understanding the complex process that is attaining a college scholarship. Through their step-by-step articles and breakdown of scholarship types, students can quickly get up to speed on how to approach them. NAAS Scholarship Programs showcases some of the best scholarships to get involved with due to their accessibility, amount, and other factors. The site also is kind enough to break down all of the scholarships into the different types you would need to know. The Illinois Student Assistance Commission is an incredible resource for just about every aspect of college. Through their vast library of information, they serve almost every type of student you could imagine. They also list scholarships relevant to the state and help for parents as well. International Student equips those who go to school in another country with all the support and resources to properly attain scholarships. The goal of these is to fill the gap that typically exists from students who go to attend college outside their home country. The Scholarship Workshop keeps students up to date on the latest happenings on scholarships, hiring educational speakers, and even books on how to get the scholarships you deserve.